Frisbee has never really gotten its due. Maybe because that's because Frisbee isn't really due for its due. After all, with the exception of Ultimate, it's more a low-key, non-competitive, catch-with-one-hand-drink-with-the-other beach activity more than a sport, right? 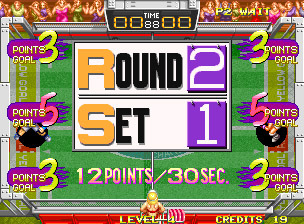 Windjammers begs to differ, cranking the adrenaline and making a simple game of catch almost into a contact sport. 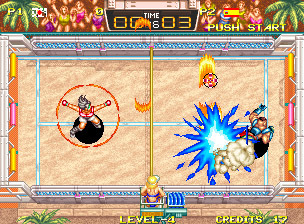 Windjammers = Beach volleyball + Pong + (Street Fighter - Hitting People). Six international competitors battle it on out multiple court types--all of which have nets, and some of which feature obstacles--in a high-energy, goal-oriented game requiring serious twitch reflexes. 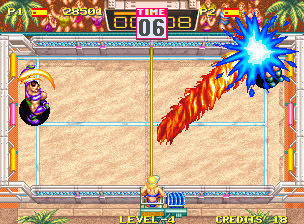 Not only does the "flying power disc" in question move fairly fast on its own, but players can add english to their tosses with half-circle moves, and can even unleash super moves, complete with flame trails and looping paths. Each court has different goal areas behind the player worth either 3 or 5 points; any dropped disc immediately scores 2. With a default match length of 30 seconds and some very capable A.I., it's a straightforward goal of "score on them before they score on you." 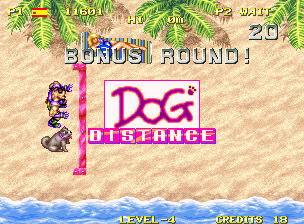 The single-player ladder is broken up with bonus games like Dog Distance, wherein a disc is thrown and you assume the role of a dog racing along the beach, trying to catch it without tripping over the sunbathers. Thanks to the blistering pace, with just a stick and two buttons (for high and low throws), you'll have your hands full. 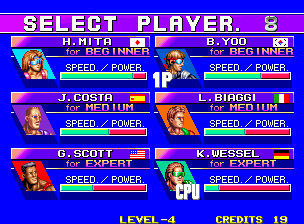 Defense is key but difficult to master in Windjammers; if you zig when you should have zagged, you're toast, and the computer A.I. knows how to play the game very well. Scoring on the computer feels like a real achievement; shutting it out is a short-lived miracle. In two-player games, it's a different animal, of course, but the computer's tougher than most humans will be. You know how video games come with an obligatory warning about the danger of possible epileptic seizures? This game's match-up screen is like a try-at-home test for that, a blinding flash of blue and white that will max out your monitor. Otherwise, characters are squat (you'll see them from a mostly-top-down perspective) but well animated, and the attack effects like fire, electricity, and other power artifacts are fairly cool. But there's really nothing here beyond the retina-burning "vs." bumper that will even give you pause, and only very slight use of the Neo's scaling effects. If the old 80's band Survivor were locked in a prison cell with only Casion instruments to keep them company, this is what they'd come up with instead of "Eye of the Tiger." Not only does the music sound cheesy and forced-happy, it's also compressed fairly heavily. Each character has their own little quips to unleash during play, and if they're all as stereotypically corny as the American character's, I weep for our global brothers. Once again, that hard-assed A.I. will keep you good and challenged in single-player games. If that's a bore, this is a great two-player battle in the tradition of Pong, but with much more technique and strategy. 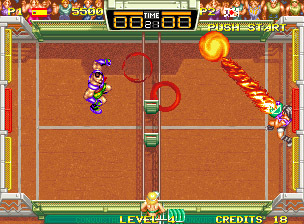 Windjammers is another oddball in the Neo library--it draws on previous games but synthesizes them into something new. 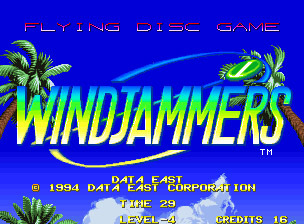 For a proper SAT analogy, "Windjammers is to Pong as Magical Drop is to Tetris." Maybe it's more like "...as Money Puzzle Exchanger is to Magical Drop," though, because Windjammers doesn't necessarily improve that much on the original Pong formula--it just bulks it up and throws in some new and unusual options. 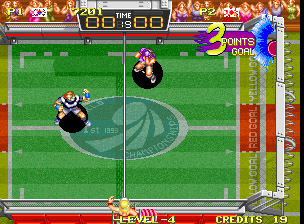 If you're looking for a new take on two-player sports games with a bit of gameplay depth, then Windjammers is worth seeking out.